The FDA approved tyrosine kinase inhibitors such as imatinib for use in metastatic gastrointestinal stromal tumor (GIST) in 2002 and for adjuvant use in resectable GIST in 2008. Unlike Gastric GIST, there is no algorithmic approach for the treatment of small bowel (SB) and colorectal (CR) GISTs. The aim of this study is to assess the trends in SB and CR GISTs treatment type over time, with reference to the introduction of imatinib, along with overall survival (OS) by site and treatment type, in the United States. Patients diagnosed with SB and CR GIST were identified from the National Cancer Database from 2004 - 2015. The primary outcome was 5- and 10-year OS. Analysis was stratified by site, time period (before [2004-2008] and after [2009-2015] imatinib), and treatment type. OS was analyzed using Kaplan-Meier survival curves, log-rank test, and Cox proportional hazards models. 8,441 cases were included (SB: 81.66%; CR: 18.34%). Although the two sites were similar with respect to Charlson comorbidity score, SB GISTs tended to be larger in size and have greater rates of metastases. 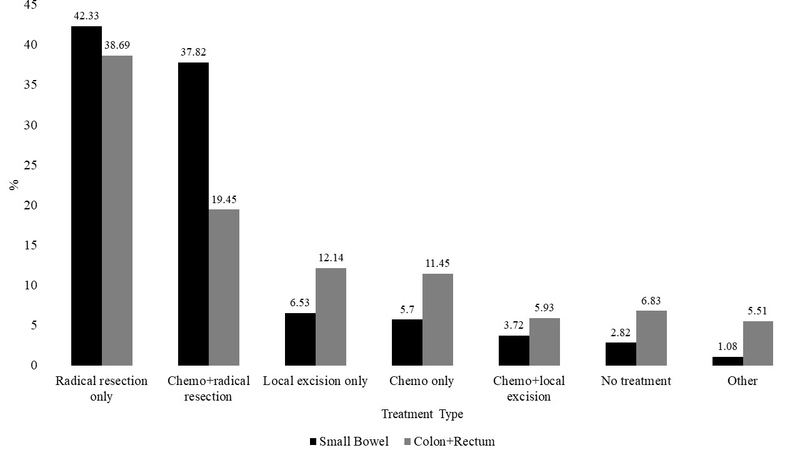 Radical resection alone was the most utilized treatment (SB: 42.33%; CR: 38.69%), followed by chemotherapy with radical resection, local excision, and chemotherapy alone (Figure 1). 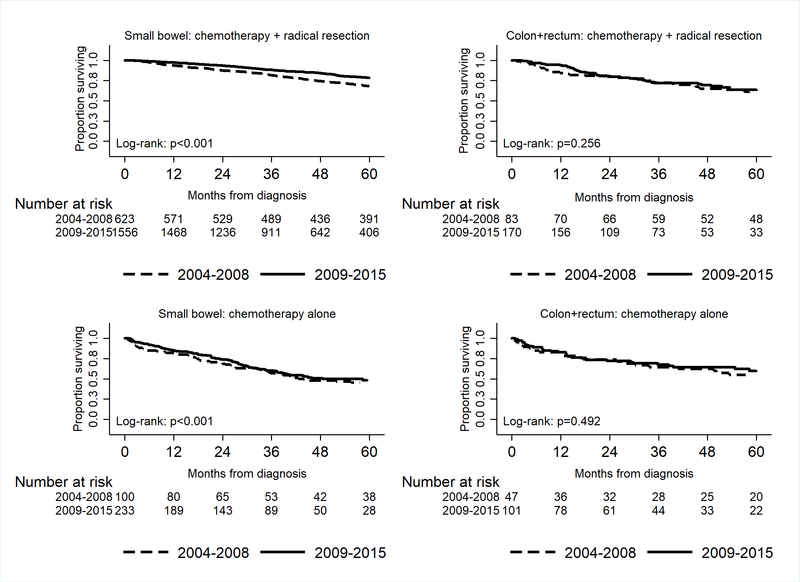 The use of chemotherapy with radical resection for SB GISTs increased significantly between the two periods (2004-2008: 31.76%; 2009-2015: 40.43%; p<0.001), and was associated with significantly improved unadjusted and adjusted OS (unadjusted 5-yr OS 2004-2008: 68.02%; 2009-2015: 78.41%; p<0.001) (2009-2015: adjusted HR [AHR] 0.73, 95% CI 0.59-0.89, p=0.002) (Figure 2). No similar observation was found in the CR group. Patients with SB GISTs had better 5- and 10-year OS compared to CR (SB: 69.83% and 47.68%; CR: 61.33% and 45.39%; p<0.001), even after stratifying by treatment type, tumor size, and adjusting for other factors (SB: 5-year AHR 1.35, 95% CI 1.16-1.46; 10-year AHR 1.23, 95% CI 1.10-1.39; each p<0.001). Chemotherapy with radical excision was associated with the best OS rates for SB GISTs (74.76%/49.02%), while local excision alone offered the best OS for CR GISTs (75.79%/60.70%). Chemotherapy alone was associated with the lowest OS rates in both groups (SB: 47.45%/19.87%; CR: 57.23%/31.46%). CR GISTs are associated with lower rates of OS than SB GISTs. Despite the recent advances in targeted chemotherapy, radical resection is still the most commonly utilized treatment type for both sites. The combination of chemotherapy and radical excision in the treatment of SB GIST is associated with improved OS, but not in CR GIST. Further studies are needed to explore why CR GISTs respond differently to chemotherapy compared to SB GISTs. Figure 1. Utilization of Treatment for GIST Stratified by Cancer Site (2004-2015) (each p<0.01).